IN KENSINGTON, one man's trash is another man's treasure. But only if the other man pines for used hypodermic needles, slimy mattresses, dumped construction debris and maggoty Hefty bags filled with rotting food and putrid Pampers. Jamie Moffett is not such a person. And he doesn't believe any of his Kensington neighbors are such people, either. So why, he asks, must they wade through the streams of trash that meander through Kensington like tributaries to a river? If Kensington had more trash cans, Moffett believes - especially the BigBelly, solar-powered compactors that hold five times the trash that wire baskets do - the flow would slow. "Kensington has only four BigBellys, and they were bought for us by a nonprofit," says Moffett, a documentary filmmaker whose studio is in Kensington. "In wealthier sections of the city, BigBellys are everywhere. The very least we deserve is equal treatment when it comes to city services," he says. "If one neighborhood was getting dirtier drinking water than another neighborhood, no one would argue it was wrong. It's just as unfair when one neighborhood doesn't get the same trash service." That's not an entirely true statement for Kensington. Deputy streets commissioner Donald Carlton tells me that, yes, Center City has most of Philly's trash receptacles. But there are 108 wire baskets and 30 BigBelly receptacles in Kensington, Frankford and Fairhill combined - more than any other section of the city has. That doesn't mean Moffett's sense of urgency is misplaced. He's founder of Kensington Renewal, a nonprofit that rehabs blighted properties into owner-occupied homes; studies show that higher home-ownership rates correlate to lower crime statistics. The nonprofit's motto: "We play Batman & Robin, but with a paintbrush and new set of house keys." Clean streets can affect whether potential homeowners feel safe enough to invest in a neighborhood, since studies also show that communities that look as if people care are places that prompt ne'er-do-wells to take their mischief elsewhere. No wonder Moffett's dream is for Kensington to have enough trash cans to contain the waste that putrefies its streets, sidewalks and empty lots. But more receptacles aren't necessarily a solution, explains Carlton. Yes, Philly has 974 BigBelly trash receptacles (about 430 of which have recycling attachments), but they're intended for use along business commercial corridors, not on residential blocks. Not all of them were purchased by the city, either (community development corporations buy them, for example), although the city maintains most of them. Regardless of the type, Carlton says the trash receptacles are routinely "abused" in Kensington. People dump household waste in them instead of hanging on to it until trash pickup day. Others illegally dump bigger debris - mattresses, smashed TV sets and the like - right next to the receptacles, because they know the city regularly empties them. His favorite "can you believe this?" trash photo is of an old toilet, placed only 5 feet from a trash can. Its bowl and tank are overflowing - with garbage. "So many cities are dealing with this kind of abuse," he says, recalling war stories shared at a "litter summit" he attended last fall (oh, to be have been a trash maggot on that wall). "Sometimes, we'll even remove a receptacle because it actually has invited dumping, which only makes the litter worse." 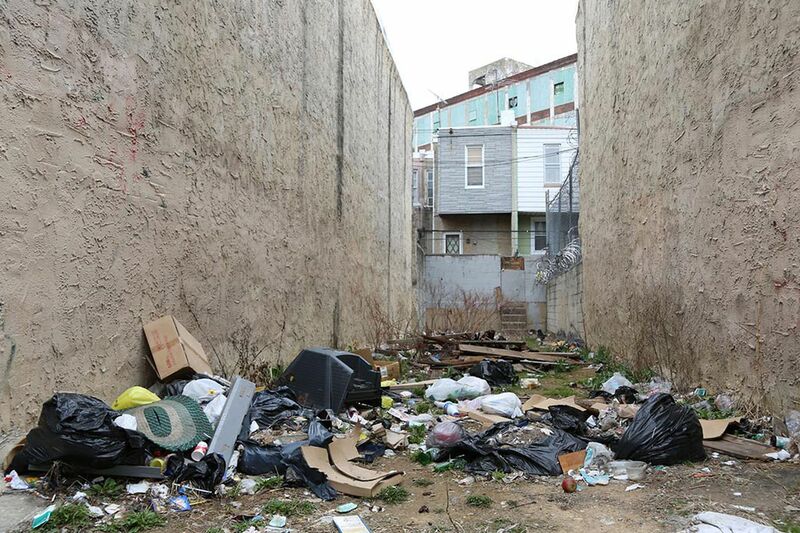 Carlton says the cause of Kensington's garbage problem is threefold: Landlords don't provide trash storage for tenants, who then dump it in neighborhood trash cans. Other homes are overcrowded with multiple families living in a single-family dwelling, and they run out of space to hold garbage for weekly pickup. And some people just don't feel like waiting for trash day. As for dumpers, well, trying to keep up with them is a problem all its own. "The solution is culture change," says Carlton. Some of which will happen when more people are held accountable for their part in the problem. Two bills introduced last month by City Councilwoman Blondell Reynolds-Brown aim to do just that. The first would reduce littering by requiring businesses that sell fresh or prepackaged food to place trash cans or recycling bins within 10 feet of the front door. The second would require owners of properties with more than six dwelling units to provide trash and recycling bins in a common area or secure outside area - and to dispose of the refuse at their own expense. "One-size-fits-all won't get us" to a cleaner city, she says. "Some neighborhoods might need more than once-weekly trash pickup. Let's put it all on the table." Instead of all over the ground.